It is well known that the creative arts can be helpful in health and healing in many ways. How can drama and story help caregivers access and express stories for hope and change? In supportive work with caregivers and healthcare providers drama and story work can help facilitate a deep form of personal self discovery while fostering empathy and understanding. Performing drama influenced activities can also help caregivers and other healthcare providers reach within and access their own stories reflecting on the past while drawing actively on the creative and expressive capabilities of the body. Through drama and story we be and we be/come, seeking to intimately know and understand, connecting with the sacred places of memory and the many stories that shape our present personal and professional identities. Embodied actions (drama exercises, enactments, performing monologues ) as well as writing personal narratives, may lead to epiphanies or resonating rediscoveries which awaken us deeply to new meanings and purpose. Narratives and stories that spring from this kind of active exploration often reflect a sense of discovery and immediacy and the process can be as rich and evocative for the writer as it is for those who are privileged to learn and witness through the performance experience. I had a special opportunity on June 9 to present as a keynote speaker at the 16th Annual Spring Palliative Care Conference presented by The North Simcoe Muskoka Palliative Care network. (NSMPCN) I have presented may times for palliative care professionals and bereavement organizations and I was most pleased to see that the North Simcoe Muskoka Palliative Care network was arranging a conference specifically around the theme,“Stories in Palliative Care”. This conference, arranged by the Conference Planning Task Group of the NSMPCN Education Standing Committee and supported by the Ontario North Simcoe Muskoka Local Health Integration Network, also featured speakers; Maureen Thornton, Nurse Educator and Practice Leader Geriatric Services, Challenges of Serious Mental Illness combined with Palliative Diagnosis, Kerry Berhalter-Whalen,Client Care Coordinator for the NSMPCN, Overcoming the Challenges, Making a Difference, Jennifer Jilks, (who provided palliative care to her mother at home and her father in long term care) Living and Dying with Dignity: A Daughter's Journey through Long-term Care" and humorist and cartoonist Mike Moore, "Laugh More Live Longer". My keynote presentation (l hr. 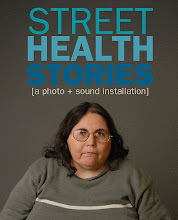 15) “Living Stories of Hope and Change” is delivered in a narrative style , a collection of “tellings”…made up of illustrative and linked stories that draw on personal experiences as well as true stories of my clients and caregivers as well as other dramatic examples of story used in research and practice by researchers and health professionals. In sharing these authentic accounts and narratives through story with audiences I perform and show how personal stories and lived experiences can be communicated in multi sensory ways, embodied physically in role, performed in monologues and presented in poetry and through ritual. A Power Point Presentation and film clips from the research based performance, “Remember Me for Birds” support the presentation with dramatic examples and offer an intimate glimpse into the real lives of persons living in residential care and their caregivers. I also support the presentation with illustrative research examples drawn from the text, “Creative Arts in Interdisciplinary Practice, Inquiries for Hope and Change", (editor, Cheryl McLean, Associate Editor, Robert Kelly, Detselig Temeron Press). The goal is to help audiences directly experience how narratives and stories are shaped within a contextual framework which draws on past and personal history, life changing events and present environment while learning about the importance of accessing, expressing and witnessing personal stories to help illuminate the lives of individuals as whole persons be they patients, caregivers or other healthcare professionals. The talk concludes with time for closure, questions and discussion. This presentation is particularly well suited for healthcare organizations (palliative care, hospice, aging, mental health) and is followed by the workshop “Honouring Life Creating Your Own Stories of Hope and Change”…which is an experiential opportunity for health professionals to take part in “step by step” drama and story based activities while working together within a community of peers to access, create and express their own stories. Cheryl McLean was recently awarded a Harrison McCain Visiting Professorship at Acadia University, Nova Scotia. She is editor of the CAIP Research Series, Creative Arts in Interdisciplinary Practice, Creative Arts for Community and Cultural Change and Creative Arts in Humane Medicine, Brush Education, Edmonton.